Guy Robertson and Pete MacPherson made the second ascent of Redemption (VIII,7) on Tuesday March 16. Heavily hoared conditions on The Stack meant it was more like Patagonia than Scotland! They found four runners on the entire route. The rime was so deep that Guy and Pete could only make progress by kicking a series of precarious steps. Conditions were very different to the first ascent when Chris Cartwright and I battled up deep powder and cracks lined with bullet-proof ice, but it sounds an equally scary experience! A good call by Pete and Guy in the current warm weather and another fabled route gets repeated this extaordinary winter! 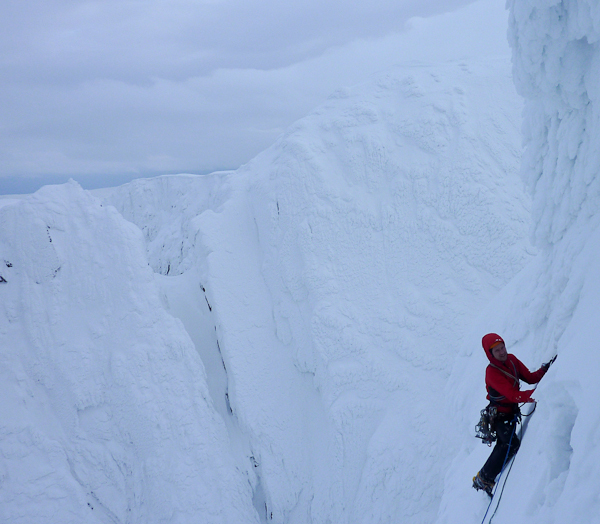 This entry was posted in Repeats and tagged Guy Robertson, Lochnagar, Pete MacPherson. Bookmark the permalink.